I was feeling uninspired yesterday…. and all of the sudden I was stoked! And these paintings were the result. I was so in the zone that I missed our local Open Studio, the first we’ve had in some time. Hopefully, we’ll be meeting again next week. I just couldn’t stop! I’m starting to be happy with some of my florals in watercolor, and I couldn’t be more pleased about it. I want to thank Jodi for the wonderful example she sets on loosening up. Jodi, you inspire me constantly. You all do, actually, but as I painted, I kept hearing Jodi whispering in my ear to let the water drip, keep it loose……and it worked! Thanks again to all of you for visiting, for commenting, for encouraging me in this crazy art journey. I appreciate you all so very much! Happy Fourth of July week to my American friends! Maybe I’ll paint more Fireworks at Dusk (thanks, Kirk). Peace and puddly painty goodness to you. Oh Laura – you are so sweet! And I LOVE all of these – I have scrolled back and forth so many times!!! I truly think every one of them has something special about it. Love the bold colors in the first one and how the background creates another abstract image – like I see an owl in it on the top left. I ADORE the looseness of the second one! And it might be my favorite because of that! Looks so effortless and free and loose, and it makes me happy. 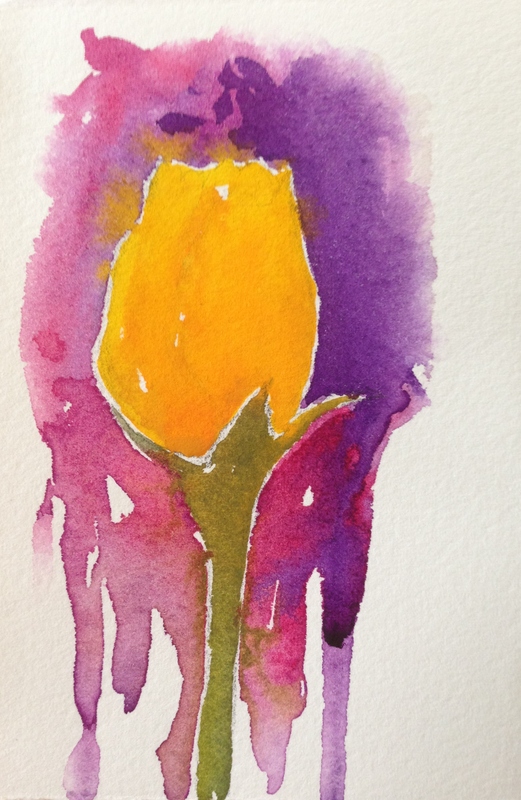 The colors in the third are very striking with their contrast, and the yellow rose is perfection. The last one is sheer perfection also. The rose looks so real, the color contrast is superb, and you did a great job leaving white around the edge of the rose to really make it pop. They are all my faves – sorry – cannot pick. You did an awesome job on this. So glad you enjoyed!!! Hugs! O M G – this is so crazy! I just looked at Etsy last night as hubby and son have been encouraging me to do same. Tomorrow’s post on my site is a set of 4 stargazer lilies I did – one I really struggled with – but they told me all are nice. Anyway – I did 6 cone flowers last night – again after all in bed – just felt free and loose. So YES YES YES I encourage you to do it and let’s share the journey together! can’t hurt – right – we are doing it anyway – see if anyone is interested. You are so funny to say I am wise – LOL! First I thought it interesting that you would post this today, when my post tomorrow is so similar – four flowers that I wonder which people like best – then you mention ETSY – and I’m like – O M G – my soul sista! LOL! Lol that’s awesome! And I agree, we’re doing it anyway, right? I do wanna look into it further though, not sure I’ll be jumping right in. I want to explore some options there and see what the best avenue is. Do you know anything about Etsy, from a shop owner standpoint? I’ve bought a few things there, but that’s really it. Not sure it’s the right way to go for me. Good luck to you with yours! You have a flair for this kind of thing, so I’m sure you’ll do well! I know zilch about marketing there though….which is part of my hesitation. You could sell your cards on there too (which I’m sure would do well, too)! I am in the same boat – have bought before, but am just beginning to look into being a shop owner. Looks like there is a minimal fee for posting items, and then they get a small percentage of sale of each item. No cost to set up shop. 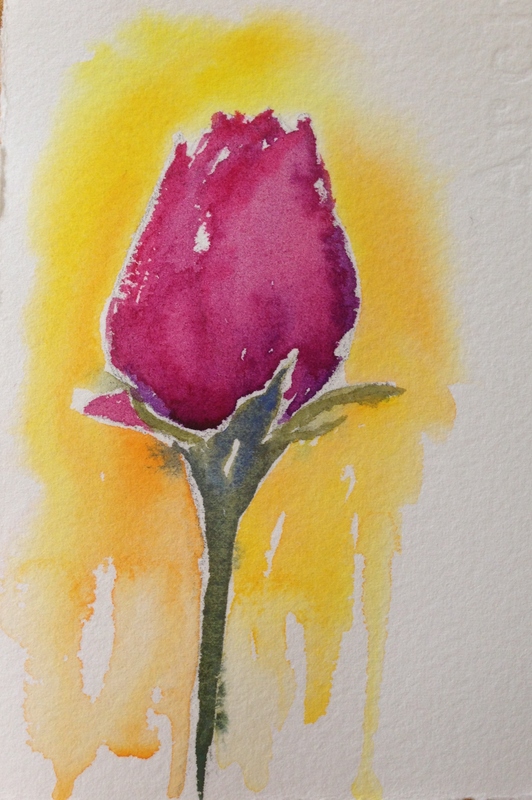 I’m looking at original watercolor flowers over there now….the prices and what’s for sale. And already thinking I’m not ready for this. Those people are good! Yeah, I don’t know. I’m going to talk to a few more people and see, but I don’t see myself bringing something new to the table over there. I really do want to start a second business, as art isn’t letting me go. I certainly have a passion for it, but I need to think it through and decide what the best avenue is for me. I wish you a lot of luck, though, I’m sure you’ll do well, whatever you decide to do! Oh you of little confidence … YOU are very GOOD TOO!!! Thanks, Jodi. I appreciate you saying so. I think it’s just my personality. I don’t leap into things. For me, it’d be a business I’d be launching, so it’s a whole other ball of wax. I’ll keep painting, it’s not like they disintegrate into dust when I finish lol. They’ll be there when I decide to take the next step (or not). I’ll be curious how you find it, and what you think of the experience. You have a flair for packaging though and all of that. It’s a natural fit for you, I think! It is kind of my “thang.” I am in “communications” LOL! Hubby tells me I get paid to talk. If it were only that easy. I write way more than I talk. But anyway – we’ll see how things go. Thanks! Lol! Well and you just have a flair, I think too. Good luck with it!! The last rose looks the most round and full of promise to blossom. Though that first yellow one just may have some real orange-red petals when it does! When I’m stressed I knit too, strange ! I think knitting is very meditative. I think it’s a great stress-reliever. Much like painting, sewing…..good for the soul! I like them all, but would give my vote to the red rose with the sunny splash of yellow background. Something about this one made me smile. All are beautiful. 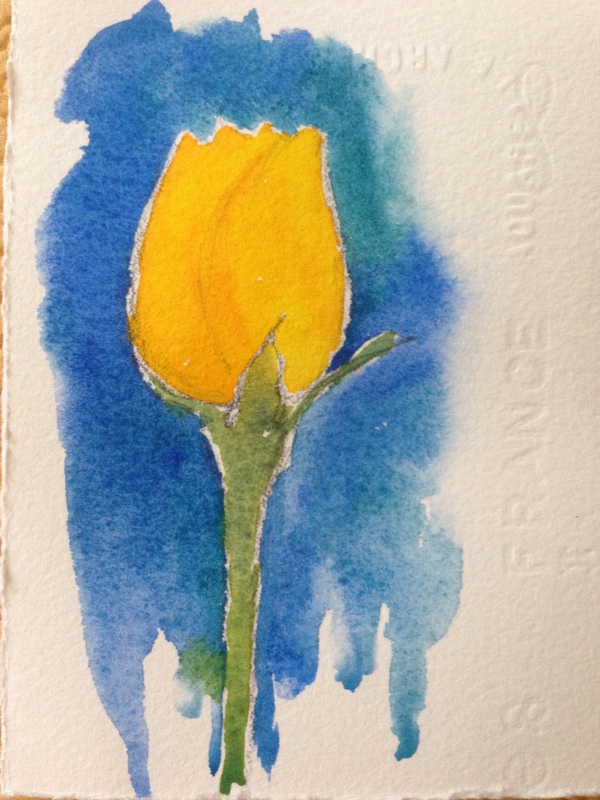 I particularly like the stem and leaf work on the yellow rose with the blue background. The first and last are my favorites, but I think they are all lovely! Happy Monday! Thanks, Teresa! Same to you! These are all wonderful, but the yellow on blue leaped off the page at me. I really like that. Thanks, Kirk! That was Hub’s favorite, and mine too! I love blue and yellow together. 2 and 4 are my favorites. I really love the colors in those two. I think I can do this. You inspire me! I haven’t picked up my paints in over a week. I hope you do it!!! It’s so much fun! Thanks for your vote! They are all great. No 2 is my favorite of a beautiful bunch! So pretty! However, my favorite is #2! I think I like the bottom one best, and that’s mainly because of the contrast of both complementary colors and the tones of that color. Too often I get my lights and darks all the same tone, and there appears to better contrast and for me more interest in that one. Have fun! Thanks, Richard! It’s lots of fun. Thx for your vote! Love them all – after having gone back n’ forth many times, I can’t choose. Each has it’s own charm, from mingling colors to form and edging – wonderful! Thanks Jill! I love all the colorful hearts you used! I like the first and second ones best. All pretty :-). Looks like you’ve got yourself a lovely quadriptych a la Andy Warhol. Haha, thanks! They were fun to do. Thanks, BB! I was wondering what you’d think! Hard to pick Laura, I like them all. Each one a beautiful gem! Thank you, Sharon! I’m glad you like them! Thanks, Jennifer. Yes, he recommends juicy, loosy! It was a fun lesson. Thank you, Debi! I was so happy with these, and so curious to see what you’d think! Thanks, Lia, that’s my favorite too! Glad you enjoyed them. I like the second one best, but they all sparkle. Did you paint on wet paper? I’ve never tried that. Thanks, glad you like them! 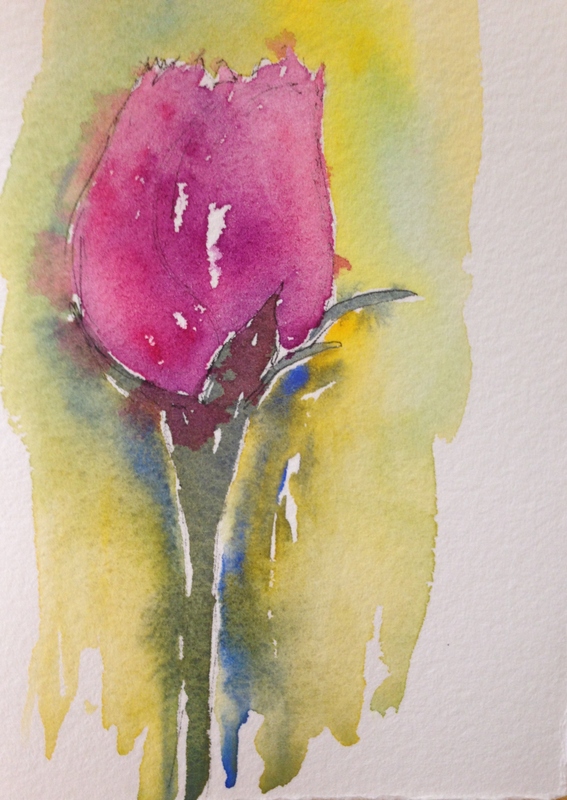 The background was wet in wet and the buds were wet on dry. I did the backgrounds first. I’d like to do more of these with other flowers. I appreciate the vote of confidence! :)) Thanks. They’re all beautiful so it’s not easy to pick one, but I pick the second one. It has nice variation of color and well balanced too. Yaaaaayyyyyy, Ann likes my painting! :))))) Ann, I’ve been wondering what you’d think! Boy, that’s a great observation re the deer and girl. I do think the white is important. I’m telling you Charles Reid is inspiring the heck outta me with his floral / still life videos. I subscribed to Artist Network TV, and his stuff is great. He is finally loosening me up (and Jodi is helping too)! But I really needed this and he leaves lots of white. Also he uses lots of paint. His colors are amazing and he mixes on the page. Also key! And cleans the palette constantly. Another key! I was color mixing and getting a uniform puddle. He says never do that. If you mix green on your palette you wanna see three colors. I’ve learned so much from him!! She is the best!! Love her. I will! Just started watching Charles Reid. Love when he´s whistling while painting!!! 😊 Great!!! Thanks again!!! Yay, Ann!! Which one are you watching? I don’t remember him whistling, though they were playing jazz in the background here and there. Ooh, are you seeing a different one? *boing boing* is it about florals, landscapes, or something else? I’m so glad you like him! Yay, I’ll watch too! ((((((Ann)))))) I’m so glad you’re enjoying him! I do think whites are key!! That’s my favorite also! I love those two colors together. That are all fantastic! But the last one is my favorite.